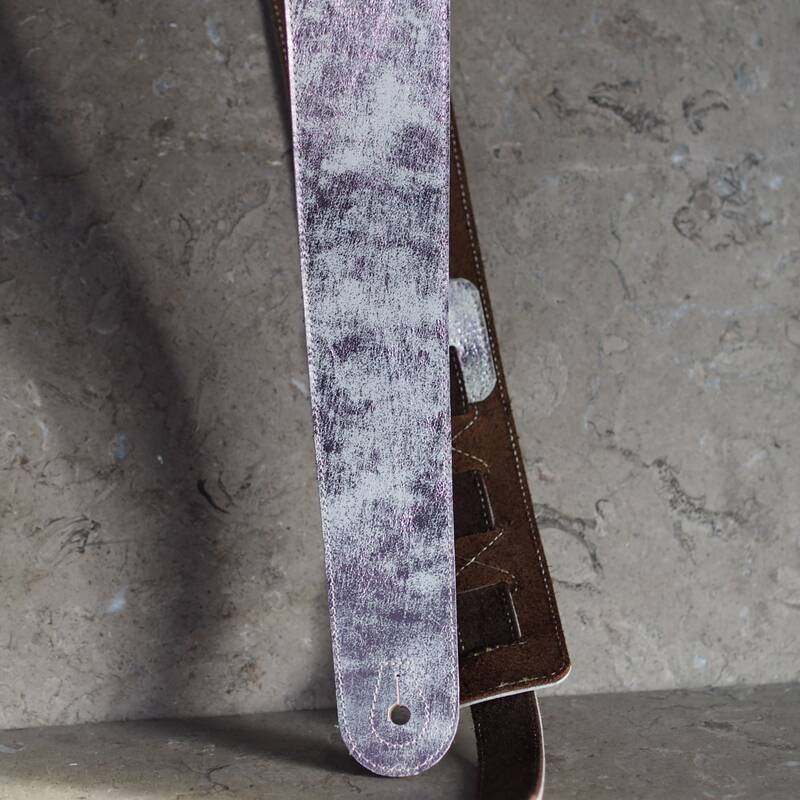 This guitar strap is made with a pink foil "wash" effect over a white base goatskin, which is layered over a brown cowhide to provide the strap strength and durability that the goatskin on its own cannot. 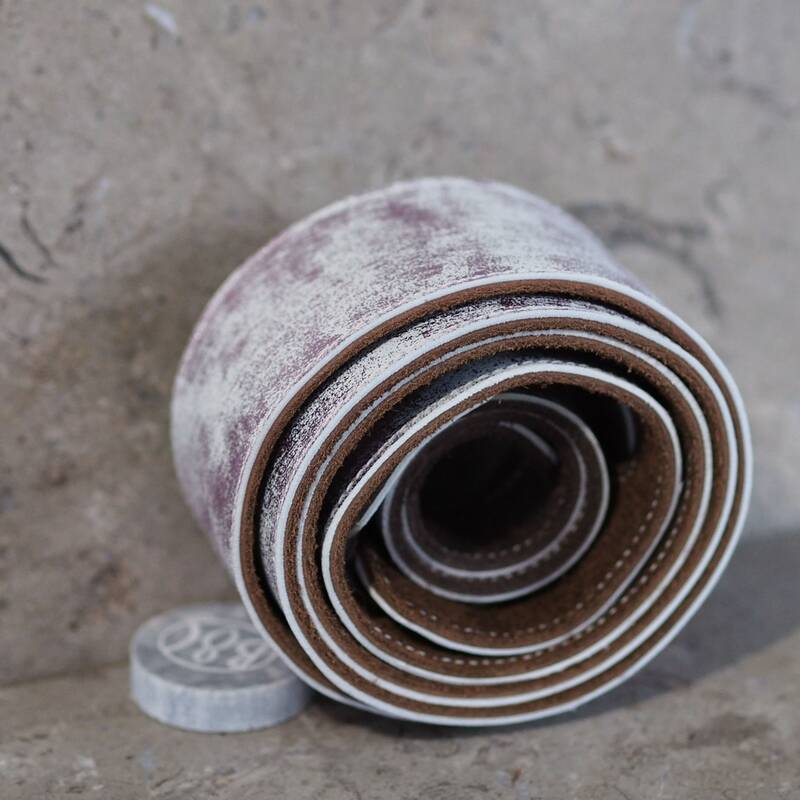 The entire main and adjustment straps are covered, and not only edge stitched with off-white thread, but the stitching weaves around each of the adjustment slots on the main strap. (This was all done free hand, so variations may exist). The overall length is about 48 to 60" between peg holes with the eleven adjustment slots cut about every 1", and the 1" wide adjustment strap loops through the chosen slot and is woven through the other slots to provide the desired length and fixes to the back pin on the guitar. 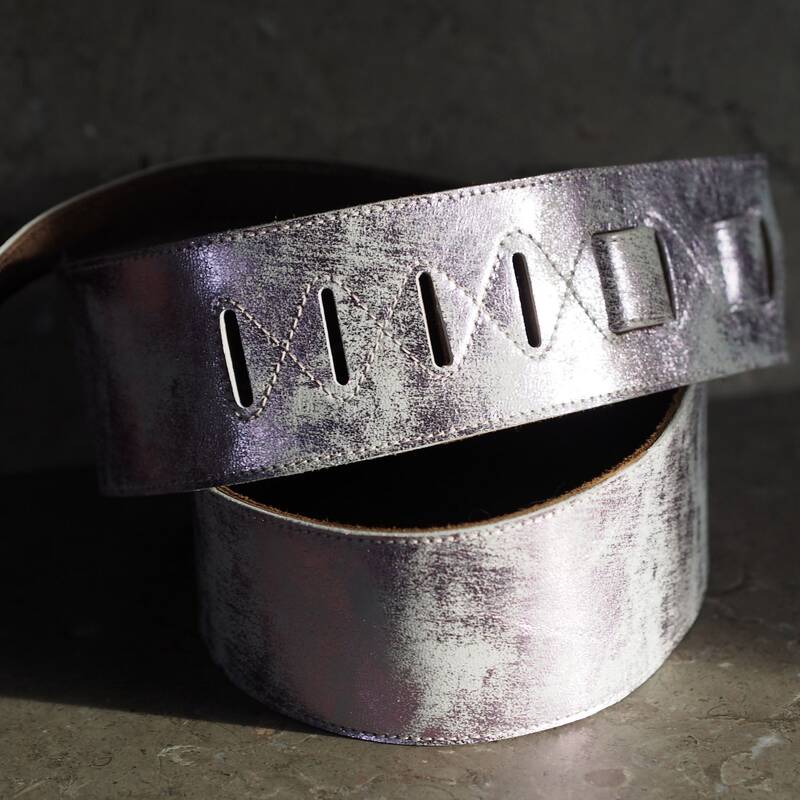 The main strap is hand cut to 2 1/2" wide and tapers slightly at either end, and is about 42" long. I have softened the cut edges with a small bevel tool, so there is a gentle transition from the top surface to the edge. (This is seen on the areas without the overlay). I cut the adjustment strap to about 22", but since I cut these myself, I can easily modify the length or spacing to get the fit that works for you. 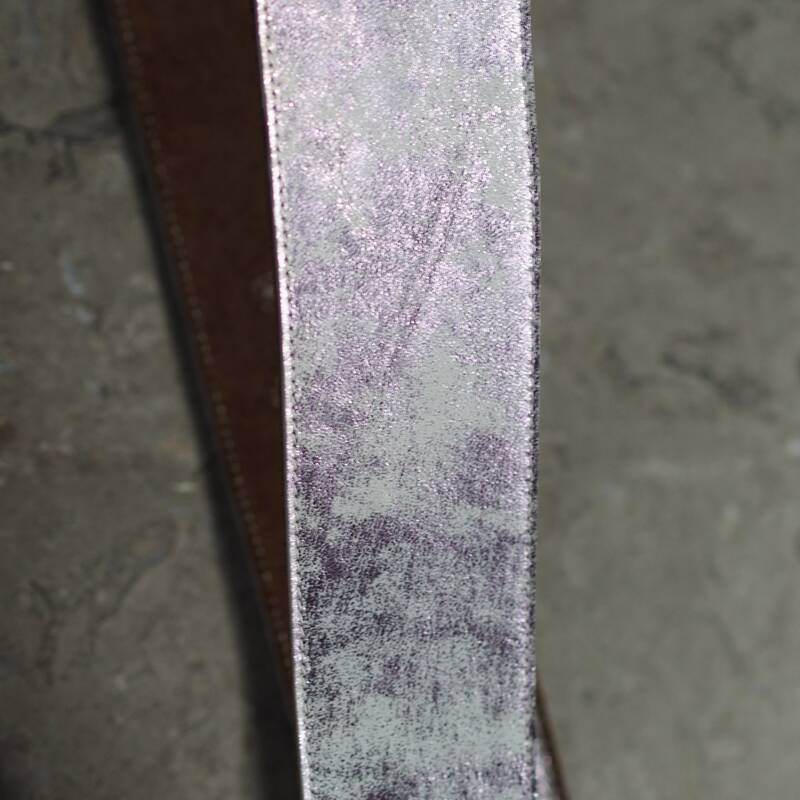 This leather is just over 0.08" (2mm) thick, and will settle in with use, like all good leather does, but it will not stretch out with use! The holes for the front peg is punched at 5/16", and rear tab is 3/8". Each end has a small slit that ends with a small hole for a "keyhole" effect to prevent tears and to make the strap easy to install & remove. The hole and can accommodate most pegs, but remains securely in place. If you have a specific peg size you need to fit, please let me know. I have also stitched around the front peg hole to ensure the layers don't separate with repeated install/removal from the peg. 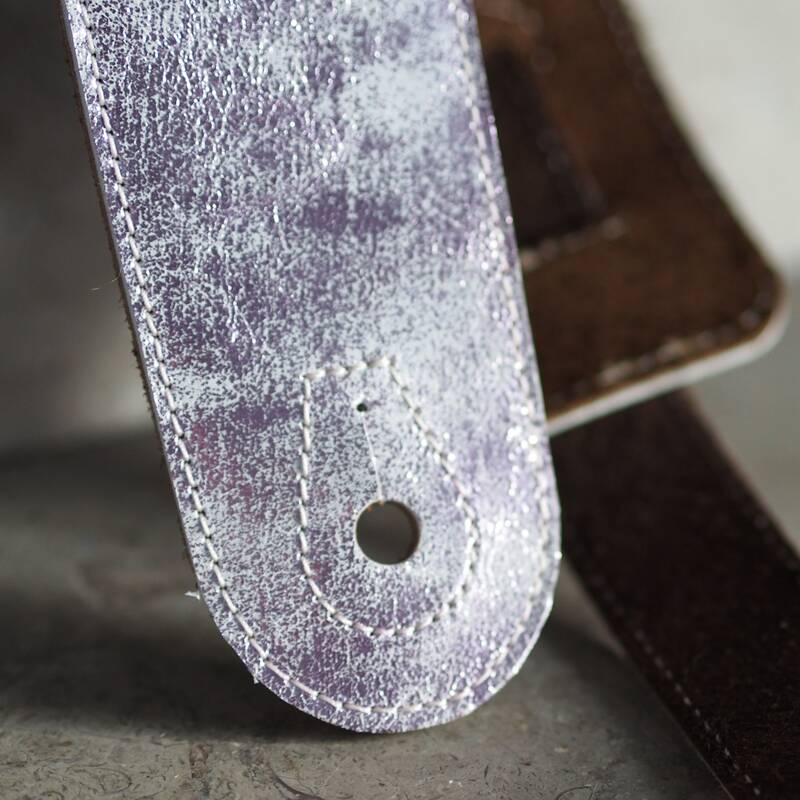 This strap is ink stamped with my B8C logo on the underside of the main and adjustment straps. 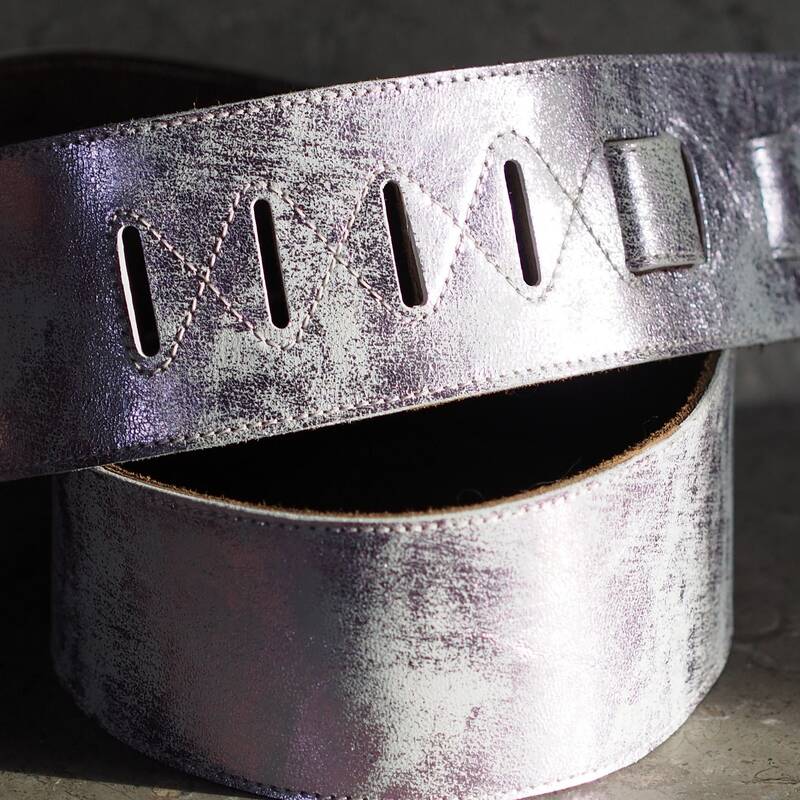 The design means the strap is only leather, and there is no metal or plastic hardware that could annoy you while you're playing, or your knock into you instrument while it's being moved or stored. I can also provide coordinating leather "laces" if you prefer to tie the strap to the neck of the guitar, rather than using a front peg. There is no extra charge for these when you order the strap, but please note in the order you want it included. 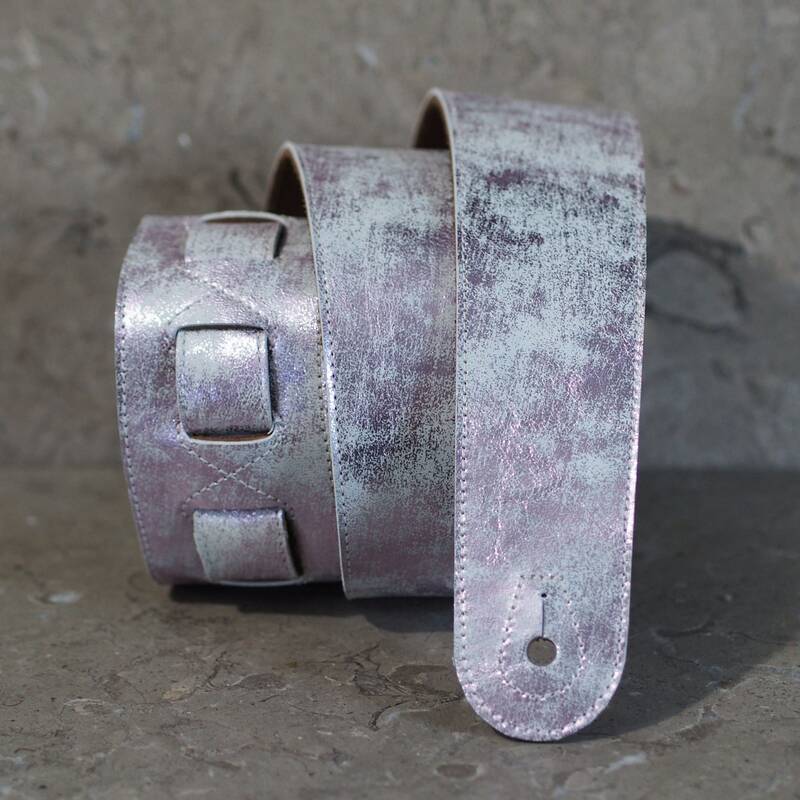 This listing is for the strap in the photos, but I have more leather available, though the wash pattern is random, and varies a bit across the hide. If you have any questions, please convo me! I only use your address for shipping, and only contact you regarding your order (usually per Etsy convo), or from conversations that you have initiated. I respect your information, and do not share it with anyone, outside of what is necessary to create your order's shipping label--and nearly all are via Etsy labels, so it's information you have already placed in the Etsy system. I do retain hard copies of order and label receipts for a time necessary for my tax processing, but I then do obliterate these hard copies. Yes, most items can be made in a custom version per your color/size preference. Most guitar straps & even other items can have a name, image or some small message added to them via silk screen, laser etching, or stamping. Please convo me if you're interested in this option.